Self-awareness, the ability to assess and even doubt one's own thoughts, is a crucial sign of intelligence, but it's also one of the hardest traits to identify. Macaques have now demonstrated they have self-awareness...which might explain our own evolutionary story. Other than humans, it's a short, eclectic list of animals that have demonstrated even vague signs of self-awareness, ranging from elephants to dolphins to magpies. Researchers at the State University of New York at Buffalo decided to test animals far more closely related to us by looking at the reactions of macaques to a computer test. These monkeys were trained to judge the density of a small box that appeared on the screen during each round of the game. The monkeys had three choices: "S" for sparse, "D" for dense, or "?" for pass. If they judged the density correctly, they would get a treat and go immediately to the next round. The monkeys gained a knack for their task, blasting through levels and gobbling up treats as fast as they could. The only punishment for misjudging the box's density was a few seconds worth of delay before going on to the next round. But by hitting the question mark and passing on that particular round, the macaques could move on without a pause and instantly have a shot at an easier box and a better chance at a treat. The macaques quickly incorporated the "?" into their strategy, frequently passing over levels that they felt were too difficult. This is the exact same behavior humans exhibit during similar types of quizzes, and the only way the macaques could choose to pass is if they had some sense of their own ability to guess the density. That's direct evidence of self-awareness in the macaques. Crucially, another monkey species, the Capuchin monkeys, did not pick up on this strategy and stuck purely to guessing the density. This suggests they don't have the same capacity for self-awareness that humans and macaques do. There's another crucial difference between macaques and Capuchin monkeys. 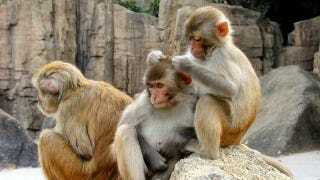 Macaques are Old World monkeys, meaning they live in Africa and Asia. The Capuchin monkeys are New World monkeys, meaning they come from the Americas. All the Old World primates - and that includes us - share a common ancestor that the New World monkeys don't. This could mean self-awareness is something that dates back to the Old World primate common ancestor, and that one of the key aspects of our intelligence evolved long before our particular species - indeed, before our particular genus - ever did. "Monkeys apparently appreciate when they are likely to make an error. They seem to know when they don't know. There is a big theoretical question at stake here: Did [this type of cognition] develop only once in one line of the primates — emerging only in the line of Old World primates leading to apes and humans? [Self-awareness is] one of the most important facets of humans' reflective mind, central to every aspect of our comprehension and learning. These results... could help explain why self-awareness is such an important part of our cognitive makeup and from whence it came."